The Eberhard & Co manufacture was founded in La Chaux-de-Fonds, the historic birth place of watch-making industry by George-Emile Eberhard. 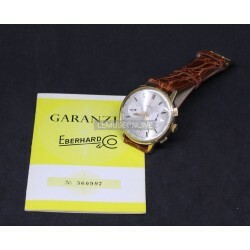 Eberhard was the son of a prominent Bernese family tracing its origins back to the 10th century which has become instrumental in the development of the Swiss watchmaking industry. 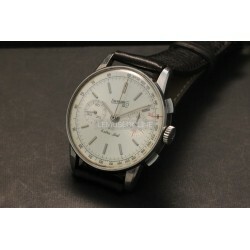 His father early initiated him to the art of watch making and Eberhard was only 22 when he founded the company. 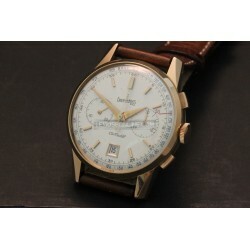 Eberhard There are 13 products. 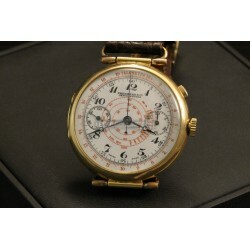 18kt yellow gold case ( diameter 39mm ) Manual winding movement caliber 65 Leather strap Beautiful original white enamel dial With single push-button chronograph Hinge back Rare particular horns Plexi glass Rare model! Made in the '30s/'40s Very nice conditions! 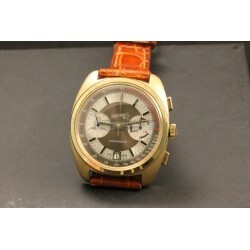 -18kt yellow gold case ( diameter 37mm )-Hand winding movement caliber 310-82-Brown crocodile leather strap-Original buckle-Argentee dial-With date-With chronograph-Plexi glass-Reference 31503-Made in the '60s-Very rare model-Wonderful conditions-With its rare guarantee! 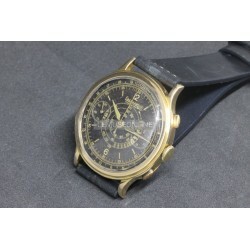 18kt yellow gold case ( diameter 39mm ) Hand winding movement Black lizzard strap Wonderful original dial With chronograph Rare dial with a scale in the middle Plexi glass Made in the '40s Almost a new old stock! It's very difficult to find a watch from the '40s in this conditions! With its original box and papers! 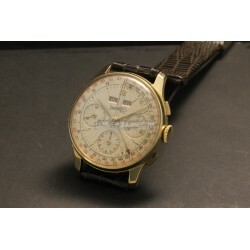 18kt yellow gold case ( diameter 40,5mm ) Hand winding movement caliber 1913 Brown leather strap Wonderful and rare original dial with a central scale With single push-button chronograph Plexi glass Made in the '40s Nice conditions! 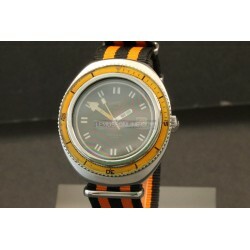 Steel case ( diameter 44mm ) Automatic movement caliber 232-123 NATO black/orange strap Beautiful original dial With date Rare orange bachelite rotating bezel Sapphire glass Reference 26022 Rare model! Made in the '70s Nice conditions! 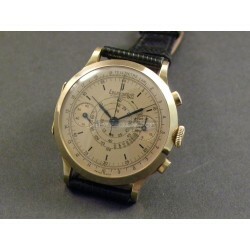 -18kt yellow gold case ( diameter 38mm ) -Hand winding movement caliber 310-82 -Brown leather strap -Beautiful original dial -With date -With chronograph -Plexi glass -Reference 14701 -Made in the '50s -Rare model -Very nice conditions! -18kt yellow gold case ( diameter 36mm )-Hand winding movement caliber 72c-Brown lizard strap-Beautiful original dial-With chronograph-With triple date calendar ( day, date and month )-Plexi glass-Made in the '50s-Extremely rare model!-Very nice conditions! -Steel case ( diameter 36mm )-Hand winding movement caliber 310-8-Black leather strap-Original steel buckle-Nice and rare dial with the red 45 and 50!-With chronograph-Plexi glass-Reference 31003-Made in the '60a-Very nice conditions!